Alfred Charles was born 1896 in Dry Doddington, where his father (William Charles) was a horsekeeper. By 1911 the family had moved to Frieston where William worked on a farm. After leaving school, Alfred moved to Bleak House Farm, Hough on the Hill, where he worked as a waggoner for Richard Hall. His elder brother, Tom Charles, stayed in Frieston and worked in the ironstone mines. 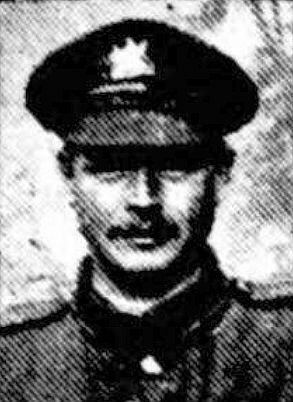 Alfred enlisted at Grantham in May 1916. He joined the South Staffordshire Regiment; perhaps because part of the Regiment was training at Belton Park at the time. He was sent to France in Sep 1916 and at some point he transferred to 2/9th Battalion, Manchester Regiment. He was home on leave in Sep 1917. Back in France in October 1917 he was wounded in the back and right shoulder and sent to 1st Birmingham War Hospital. He was the 5th Caythorpe man to be injured in a fortnight. In Nov 1917 he was sent home on 10 days convalescence leave. In Feb 1918 2/9th Manchesters merged with the Regiment’s 1/9th battalion. Alfred was killed in action on 21st March 1918 on the first day of the German spring offensive – the Battle of St Quentin – in the area of the 1916 Somme battle. He has no known grave but is commemorated on the Pozieres Memorial.